The steady state nonpulsating flow patterns produced by both high-speed volute-type and standard-speed regenerative-type (regenerative turbine) centrifugal pumps are similar. Ease of maintenance and flow control give both of these centrifugal pump types certain advantages over the admittedly more efficient high-head, low-flow positive displacement pumps. Of course, the latter are known to exhibit pulsating pressure and flow characteristics. Notable exceptions notwithstanding, centrifugal pumps thus offer overall advantages that offset their reduced efficiencies at what are generally understood to represent low flowrates, i.e., rates below about 50 gpm. However, when selecting centrifugal pumps for low-flow applications, one must compare the typical characteristics of standard-speed (3,550 rpm) regenerative turbinepumps with those of high-speed volute pumps. 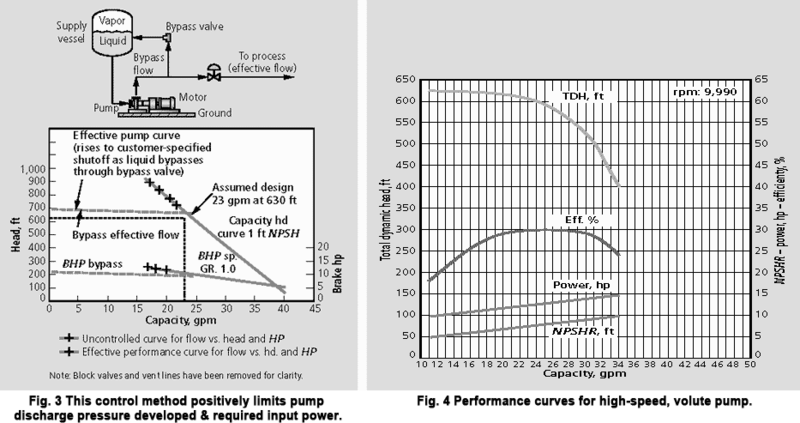 With both pumps having similar efficiencies, why or when would a low-NPSH regenerative turbine pump (Fig. 1) be preferred over a high-speed, volute-type centrifugal pump? A typical low-NPSH regenerative pump performance curve is pictured in Fig. 2. At an assumed selection point of 24 gpm (~1.55 l/s) and 600 ft (~183m) total dynamic head, pump efficiency is about 38%, requiring 9 hp (6.6 kW). This pump operates at nominally 3,600 rpm and only requires 1 ft (~0.3 m) of NPSH. The steep head-capacity performance curve combined with a pressure limiting bypass valve set at 700 ft (213 m) allows use of a 10 hp (~7.5 kW) motor. Note the absence of the typical centrifugal "curve run-out" problem. On typical volute-type centrifugal pumps, curve run-out means that higher flows require higher power input. If, in a regenerative pump, flowrates should ever exceed the design rate of 24 gpm (~1.55 l/s), required power would decrease. For flowrates less than 24 gpm, pressure and power limitation are achieved through use of a bypass valve. Overloading the 10-hp motor is thus avoided. At the 24-gpm operating point, the motor operates at 91% efficiency, with a power factor of 0.87. Fig. 3 shows the best control method for this type of pump. This method positively limits pump discharge pressure developed and required input power. As mentioned, the high-speed, volute-type centrifugal pump is an alternative process industry selection for low-flow/high-pressure applications. Compare selection and operation at the same duty point (24 gpm at 600 ft). This type of pump would perform as shown in Fig. 4; it uses a speed increaser and operates at 9,990 rpm. Hydraulic efficiency of this pump is about 30%. While seemingly about 25% less than the regenerative turbine pump efficiency, it is probably comparable, considering the difficult selection point. From the curve shown in Fig. 4, required power at the design point is 12.5 hp (9.3 kW), indicating that both pumps have similar performance at the design flow of 24 gpm. Unless equipped with an inducer, the volute pump requires 8 ft (~2.5m) of NPSH. Although power and efficiency performance of both pump types at the design point are similar, the "devil"—as usual—"is in the details." The complete high-speed pump story must consider "curve run-out" to protect the motor in the event of excess flow (above 24 gpm), which causes a higher power requirement. From Fig. 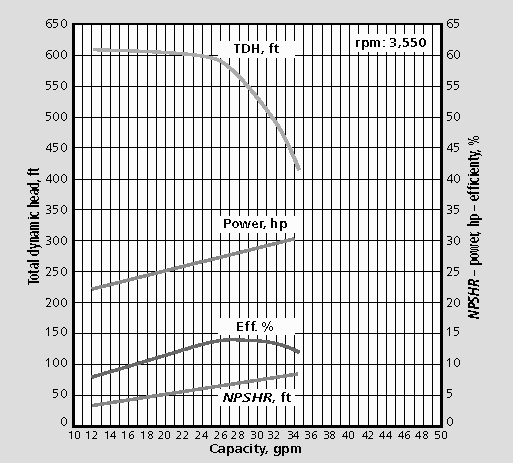 4, maximum required power is approximately 14 hp (~10.5 kW) at 34 gpm (~2.18 l/s) flow. Prudent design would call for at least a 15-hp (~11.2-kW) and possibly a 20-hp (~14.5-kW) motor. Even though design point efficiencies and power are similar for both pumps, the high-speed pump with a typical "flat" or "drooping" volute-type performance curve requires a motor 1½ or 2 times as large as the regenerative pump with the "steep" curve! Looking at the standard speed competition. 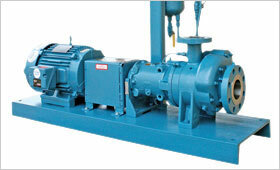 A second comparison can be made with a more standard speed, 3,550-rpm, volute-type centrifugal pump. Its performance, shown in Fig. 5, has an even more pronounced "curve run-out" problem. Note that at the design point (24 gpm), its efficiency is only 13% and the pump demands 27 hp (~20 kW)! At maximum flow (run-out), the pump would require slightly more than 30 hp (~22.4 kW). Clearly, the high-speed pump with the 15-hp motor is an improvement over the 3,550-rpm volute-type pump. However, the regenerative turbine pump, requiring only a 10-hp motor and having a required NPSH of only 1 ft, might indeed be a better selection than either the "high"- or "standard"-speed volute-type pump. In summary, a comparison of only first cost and design point efficiency may be misleading. Although both the high-speed and regenerative turbine pumps may have similar cost and design point efficiencies, they will actually require very different motor and power operating costs. Unless curve run-out of a volute pump can be limited, the regenerative turbine pump is clearly the better choice when operating conditions call for low flow (say, less than 50 gpm) and high head (over 300 ft). In addition to power consumption, the very low NPSHR of only 1 ft of the slower speed regenerative turbine pump offers an additional advantage over the 6–8 ft NPSH requirement of the typical volute pump. Any negatives? Yes, regenerative turbine pumps are more sensitive to abrasive-containing media. 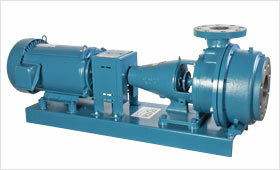 However, for clean pumpage, these pumps may often be your best choice. Steve Muller is president of Stephens Mechanical Associates in Bandera, Texas. He has had a 40-year involvement in the pump industry, including sales, service and application experience with reciprocating, rotary and centrifugal pumps. Mr. Muller earned a bachelors degree in mechanical engineering from Rice University and is a former naval officer. He can be reached at stephensmech@aol.com. Article copyright © 2004 by Gulf Publishing Company. All rights reserved. Reprinted with permission from HYDROCARBON PROCESSING August 2004 issue, pgs 55-57. The newsletter is sent periodically and will keep you up to date on the latest company news, innovations, and tips. © 2018 Roth Pump Co. All right reserved.